Not only are there lots of suppliers on the market, but the way programme is delivered can vary enormously depending on an organisation’s individual approach. Most students who choose Watson Martin Partnership do so after a great deal of research to ensure they make the right decision. Doing your homework before the programme begins always pays off as, with the majority of CIPD programmes lasting a minimum of a year, building a fruitful relationship with a potential CIPD provider is likely to be a key factor in getting qualified. Michelle Dawkins discovered just this when she started shopping around for a CIPD Level 5 Intermediate Certificate in HR Management 18 months ago. An HR Adviser with The Insolvency Service, she had moved into the profession from a managerial job within the organisation and wanted to find a training provider that would understand her learning needs. “I took some time choosing who I wanted to study with and kept coming back to Watson Martin Partnership,” she explains. “I liked the professional way everything was presented. As I was applying for a long term training programme, I wanted to be confident I would be studying with an organisation that provided me with face-to-face support. Watson Martin Partnership just stood out from the start. “I had a chat with a WMP adviser who was really knowledgeable and professional, and suggested I dialled in to a podcast to find out more. This was very useful and informative. It clearly explained what the programme involved and the expectations of students and advisers. It also provided an opportunity to ask questions,” she says. Michelle knew she didn’t want to study alone and so opted for Watson Martin Partnership’s Active Learning programme with its unique blend of workshops and one-to-one support throughout the learning process. She began working straight away with her dedicated personal adviser, Amanda Harris, an HR expert with more than 20 years’ experience working in senior positions in the UK and internationally. 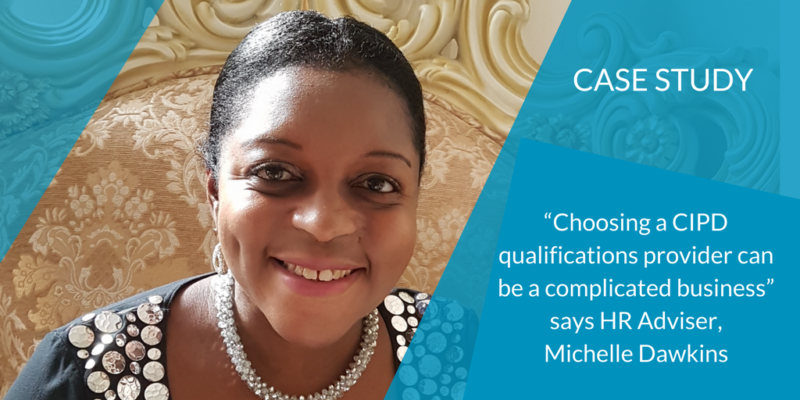 Michelle received the Level 5 qualification earlier this year and now uses much of the knowledge she gained through her studies in her daily role as an HR Adviser. Already experienced in diversity and inclusion work through establishing six new support networks within The Insolvency Service, she has learnt how to adapt the wealth of HR information available to her organisation. “I currently work on the policy side of HR which is great experience but involves a huge amount of work. Because of the research and assignments I did for my qualification, I now know which sources to access to get the information I need. I have also made a network of contacts through the workshops and we provide support to each other. Hopefully this will last throughout my career,” she adds. Michelle is planning to work in different sectors of HR. She is also interested in supporting and mentoring those who want to be introduced to the profession in order to “give something back”. Down the track, she plans on studying for the CIPD Level 7 Advanced Diploma with Watson Martin Partnership.